Raaga.com: Kareena Kapoor calls BAJRANGI BHAIJAAN cute baby as ‘Diva’! Kareena Kapoor calls BAJRANGI BHAIJAAN cute baby as ‘Diva’! Usually a Salman Khan film is dominated by the star himself but it seems in his latest film BAJRANGI BHAIJAAN, the DABANGG actor has taken a backseat and the film is overpowered by the cute little baby ‘Munni’, who has taken the national by storm by her histrionics and is being looked upon as the next big star of Bollywood! Kareena Kapoor has termed the girl as ‘Diva’ and acknowledged that she is truly the ‘Real Star’ of the movie! In fact even Salman Khan himself was sure about the tiny tots’ exceptional performance hence instead of opening BAJRANGI BHAIJAAN’s teaser with himself (as he generally does) he cleverly introduced the girl in his teaser, which had created a flutter and now after the movie is released the ‘little wonder’ has literally become the talk of the nation. So who is the ‘little angle’ Munni? Well her real name is Harshali Malhotra and she hails from Delhi. 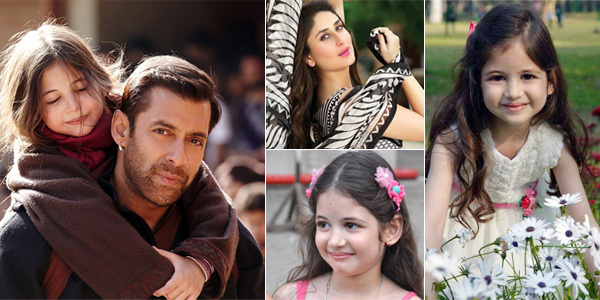 Born on June 3, 2008, the 7-years-old Harshaali is a budding talent who has to her credit multiple big brand TV commercials like Pears, Fair & Lovely and has done many print advisements like Horlicks, HDFC Bank and Apollo Tires. Harshaali Malhotra bears an uncanny resemblance with many actresses like baby Katrina Kaif and baby Kareena Kapoor and looking at her versatility it is apparent that Harshaali is sure to become a ‘Diva’ of Bollywood in near future!! !